NASCAR The Game: Inside Line is a racing game unlike any I have ever played. Expectations for the game weren’t very high, as I figured at best the NASCAR experience could only be translated into an arcade style racer, something reminiscent of the Burnout series, or Midnight Club. Instead, NASCAR The Game: Inside Line developed by Eutechnyx offered something more along the lines of a strategy game than a racer. Sure, there’s racing involved. There’s no denying what’s at Inside Line’s core. Yet, the more you play the game, the more you realize how much strategy and planning actually goes into winning on Inside Line. Patience, timing and skill are the three most important factors you’re going to need if you want to succeed in this game. Winning takes more than just sprinting to the front of the pack and holding your lead. You will need to understand how to make the most of your other opponents through the slingshot. You will need to figure out how to draft around corners efficiently to keep as much speed as possible. You will need to know how to properly avoid the barriers so that you don’t go from first place to last in the blink of an eye. It was refreshing to play a game that’s so realistic to the actual sport, even if the AI difficulty level is a tad insane sometimes. This realism didn’t just stay in the game’s mechanics though. No, the career mode of the game was highly realistic as well, much to my delight. When you first start out, you get a car that is customizable in terms of both paint and decals. You then begin racing. As you win more races, you gain different sponsors, who in turn give you credits. These credits are used to upgrade your car to help you stay slightly ahead of the pack. Thankfully, the vehicle upgrades were very well balanced alongside your progress in career mode. Another cool factor of Inside Line was the inclusion of a spotter. A spotter is a person that talks to you inside your vehicle and helps your out during the race. Say someone is steadily gaining on your from behind. He will tell you. Or, say your spotter sees an awesome opportunity for you to take advantage of a slingshot. He will tell you where and how to do it. I’m not an actual NASCAR fan by any means, so I can’t testify to how realistic the in game spotter is in comparison to an actual spotter. I can however say that in Inside Line, the spotter is definitely one of the high points of the game. The game wasn’t all roses and clovers though, unfortunately. As I mentioned above, the AI can get a bit ridiculous sometimes. Oftentimes I found myself the victim of AI violence, causing me to get launched into unavoidable crashes. Another low point for me was the graphics. The cars and drivers were animated well, but beyond that everything else was bland. It’s not exactly the developers’ fault; NASCAR tracks aren’t exactly the most diverse courses in the world. Still though, a little more switch up than what the game offered would have been nice. The worst part about the game though, and I feel a bit horrible to put it so plainly, is that the game is just kind of boring. Sure, it’s exciting for the first few races of the season. After that though, you realize that Inside line just consists of more of the same. Eventually, things just get monotonous, and all the laps in the world can’t save the game from being so ordinary. 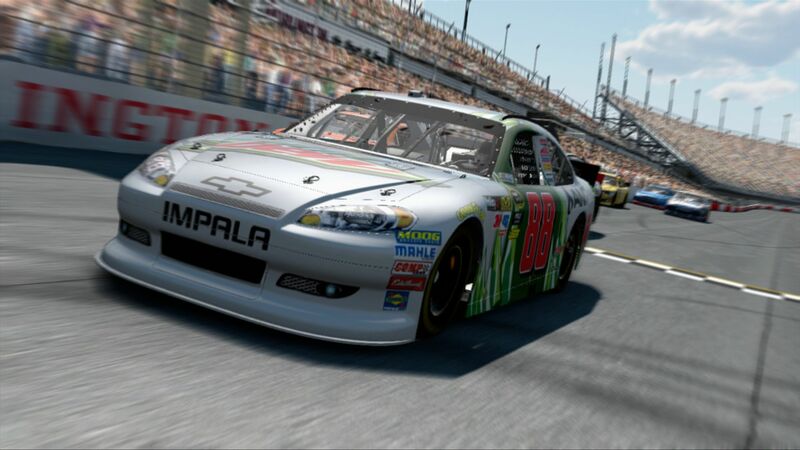 Overall, Nascar The Game: Inside Line was a surprising racer that fans of the sport will no doubt love. It showed a lot of promise that unfortunately just didn’t have a hook to keep it interesting in the long run. If you feel the need to get your NASCAR on, it’s definitely worth a rent.